If you've ever needed a way to list files and folders on Windows, you might realize that Microsoft has never actually included this feature. 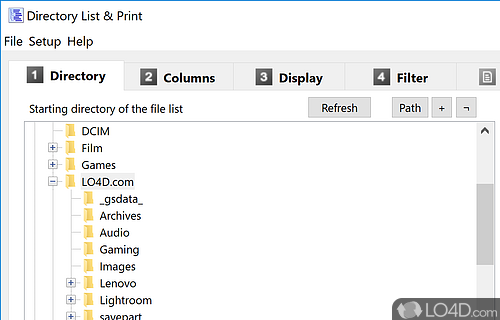 For whatever reasons you might need to create a list of files or folders, Directory List and Print Pro has got you covered. The application literally takes seconds to get up and running. Without having to actually install it, you can run Directory List and Print Pro directly by unpacking it and running the EXE file. A handy thing about this application is that it includes a very simple wizard which takes you through a few simple steps. 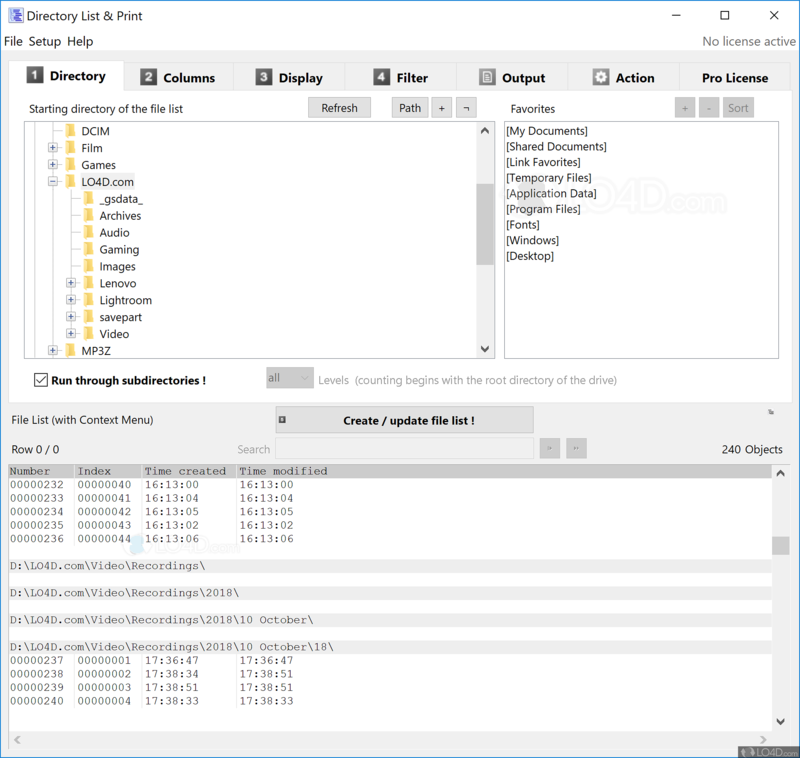 Select the files and/or folders you want to print from the Explorer-like tree structure and the details will be listed in the second half of the interface. 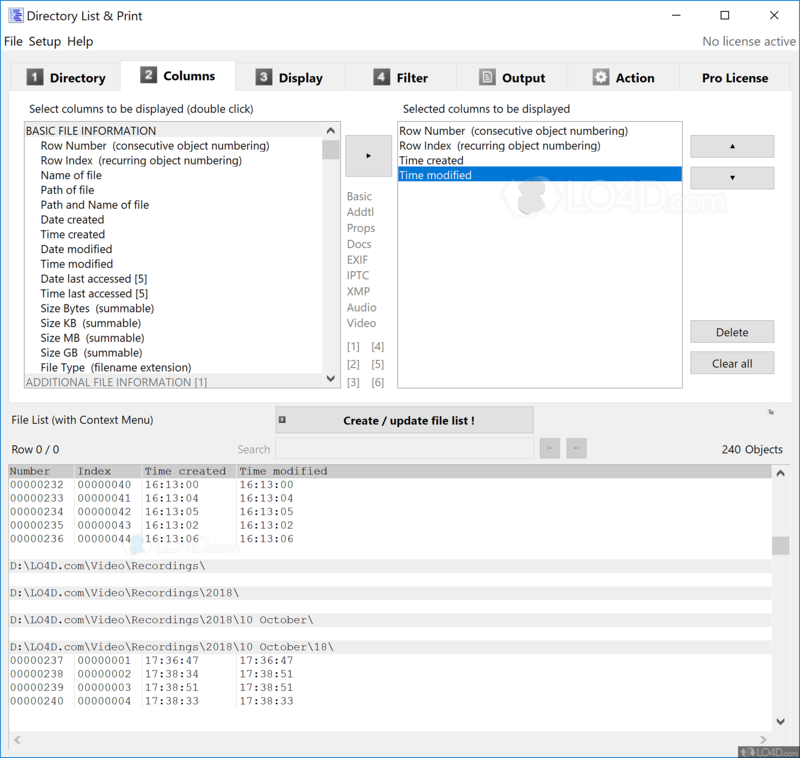 The details that Directory List and Print Pro can provide are the folder path, filesizes, timestamps and several others like file attributes, CRC checksum, row numbering and for folders: total number of files within. The output that this application produces can be plaintext, CSV files (which can be handled by many applications), Microsoft Excel spreadsheets or even Microsoft Word documents. The good thing about this program is that there exists a free version which is unregistered. Though the free version contains many useful features, the full version is considerably more comprehensive. Directory List and Print Pro is licensed as shareware for the Windows operating system from file organizer software and can be used as a free trial until the trial period ends (after an unspecified number of days). 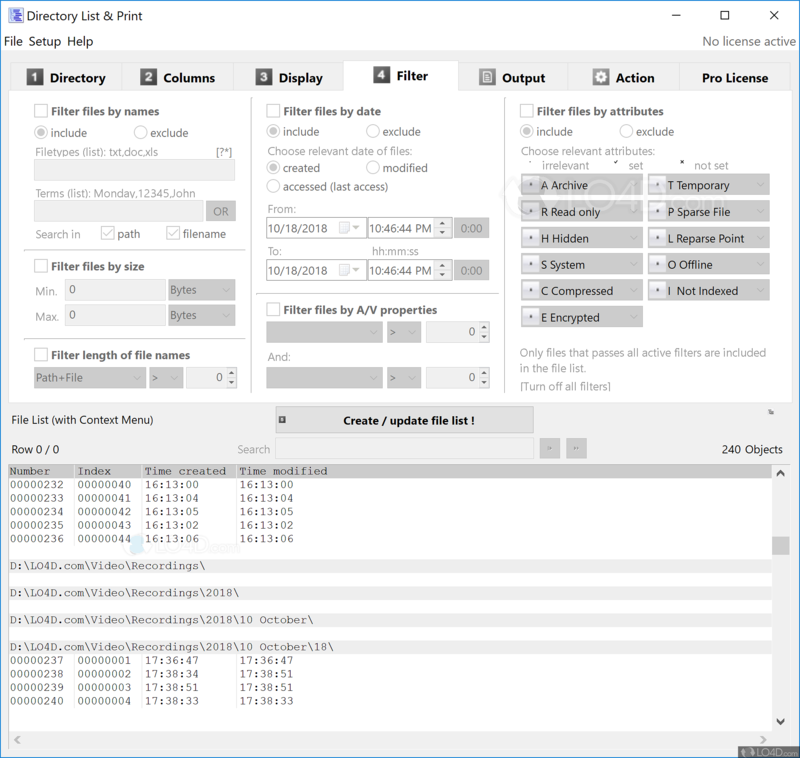 The Directory List and Print Pro 3.62 demo is available to all software users as a free download with potential restrictions and is not necessarily the download of the full version. Compatibility with this software may vary, but will generally run fine under Microsoft Windows 10, 8, 8.1, 7, Vista and XP on either a 32-bit or 64-bit setup. 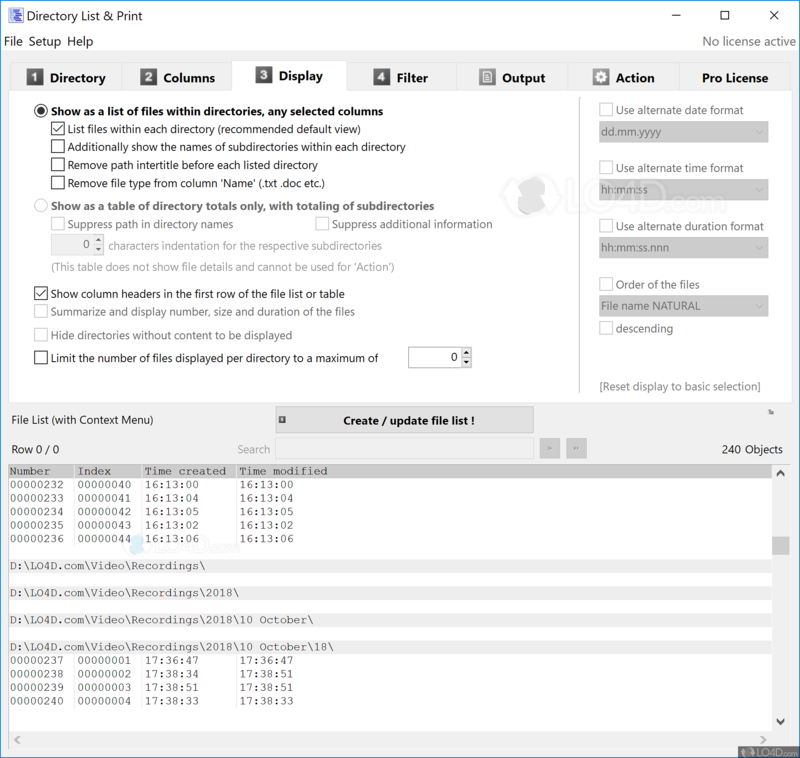 A separate x64 version of Directory List & Print Pro may be available from Infonautics GmbH. This download is distributed as DirectoryListPrintEN.zip and DirectoryListPrintDE.zip. We have tested Directory List & Print Pro 3.62 against malware with several different programs. We certify that this program is clean of viruses, malware and trojans. 4.3 out of 5 based on 14 ratings.